LESS ROUGH MORE BUFF Its definitely going to be love at first scrub with this little baby - dry, dull skin doesnt stand a chance. SugarBabys signature coconut scent just kicked it up a notch with this rich creamy scrub, enhanced with crushed Coconut Shells that gently exfoliate your skin to reveal glowy, silky skin. Nourishing Organic Coconut Oil and Shea Butter keep skin hydrated, healthy and glowing. SUGAR C-RUSH Tighten, tone and reveal. Sugar C-Rush Body Scrub is a fabulous skin detoxifier and exfoliator. 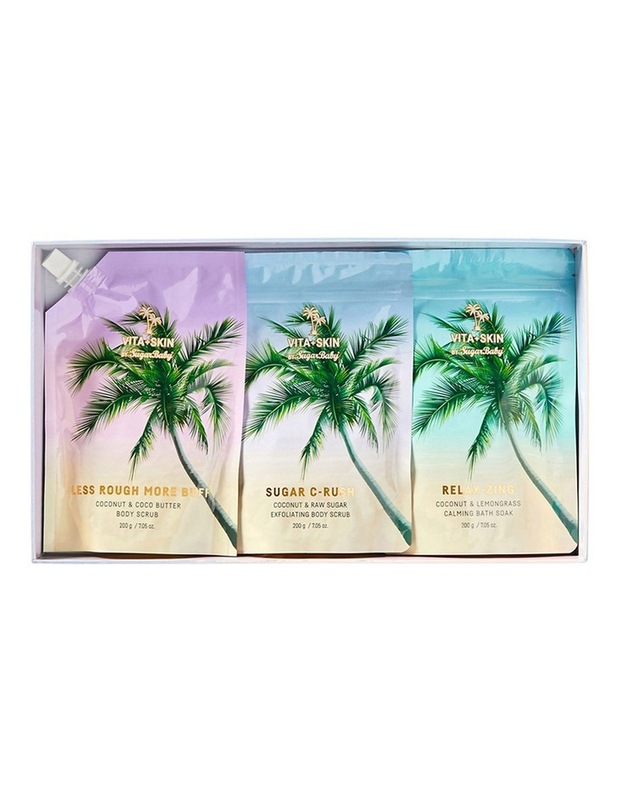 Raw sugar acts as a mild exfoliator, removing dead skin cells and exposing fresh soft skin - whilst Himalayan Sea Salt acts as a second exfoliator to polish and perfect. Enriched with skin loving Organic Coconut Oil which is incredibly moisturising and filled with vitamins and minerals to help improve moisture retention, leaving skin soft and smooth. RELAX-ZING Relax, unwind and soak away stress with mineral rich Himalayan salts to help detoxify and relieve feelings of tension. Organic Coconut Oil combined with Coconut Milk to deliver excellent hydration keeping skin, nourished and refreshed. The citrusy aroma of lemongrass infused with a natural tropical coconut, will impart a zingy spa inspired boost to your daily bathing ritual.